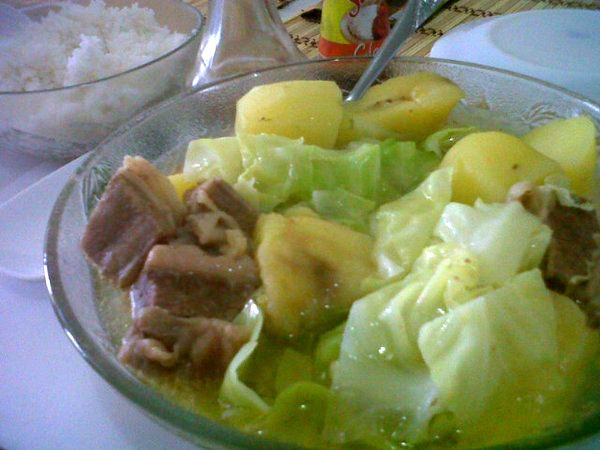 “Nilagang Baka” or Beef Stew is a common Filipino viand. A very simple soup dish that only involves one basic process–boiling. This dish has a good amount of fat/calories already. So if you’re cutting down, ease up on the rice. The potatoes in the dish can serve as your carb intake. This dish brings back lots of childhood memories. My cousin and I would help our grandmother in cooking. Fun! “Nilagang Baka” is best served during a cold weather or on a Sunday family gathering. In a big casserole, put water and beef and bring to a boil until beef is fork-tender. Skim all the scum. Once beef is tender, add 2 Knorr beef cubes. Add potatoes and saba (ripened bananas) and bring to a boil. Once cooked, lower heat and add in vegetables and cook uncovered. Sprinkle with chopped spring onions before serving. Serve hot with soy sauce and calamansi (local lemon). For those who want a pinch of spiciness, you may want to add finger chilis (siling labuyo) to the sauce. Nilagang baka is one of my favorite dish!